How to Run? | JustRunLah! 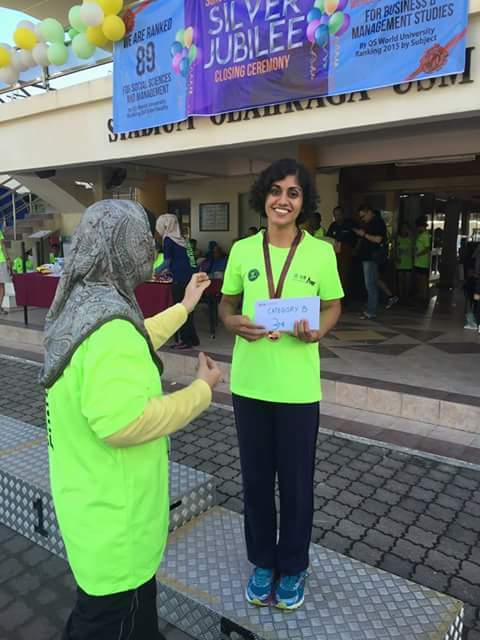 The author winning third place in the Women's Open Category of the super-hilly Universiti Sains Malaysia Fun Run 2015. I still remember the first time I ran. It was back in March of 2012. The mood just came out of the blue one day. So I decided to run around a small field outside of my apartment, roughly the size of a track, and laced up my antique sport shoes (which I last wore God knows when). Seeing all the crowd on the field that day, I had a sudden bout of shyness. Omigosh all those people are going to laugh at me! I mustered all of my courage and started my first, and final lap. I huffed, puffed, and willed my feet to move faster. But that’s it for the day. A meagre 300m. 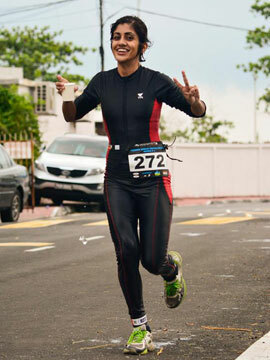 As I reached the last corner of the field, my lungs and legs gave up on me. I started walking, consoling myself that at least I managed something for the day. I did not make any eye contact with anyone on the field, for fear of judgment. I guess many people would stop at this stage and say, “running is not for me”. The thought did cross my mind. Surprisingly my interest did not wane the next day. I laced my old shoes again, and achieved three slow tortoise-like laps that day, before my lungs and legs protested again. The next week, I managed five laps, and two months later I was running 15 laps. I registered for my first 10k race at the Allianz Penang Bridge International Marathon (APBIM) 2012. When the day arrived, I was surprised that I finished the run in one hour and seven minutes. I never stopped running since then. It is a habit, a lifestyle, something which is part of me now. My motivation to run is simple: running frees my mind from discouraging thought. It has given me confidence that I am able to do something that I thought I could never achieve. I enjoy the absolute silence that surrounds my mind when I run: peaceful and tranquil; just you, your breathing, your body, your sweat, your pain, and razor-like focus; a very good feeling of being alive and well. The shyness vanished; all I see when I run is the path in front of me, and the mileage goal of the day. What are your motivations to run? The author winning third place in the Women’s Open Category of the super-hilly Universiti Sains Malaysia Fun Run 2015.
hahahahahaha – strange but similar feelings & thoughts, except i didnt feel shy. My problem was the lousy shoe that I had & I only had that pair. the knees hurt bad – i cant continue after 2 or 3 runs. Good to hear that! Good running shoes are important, and I learnt that the hard way too. But that is a story for another day. All the best for your race!